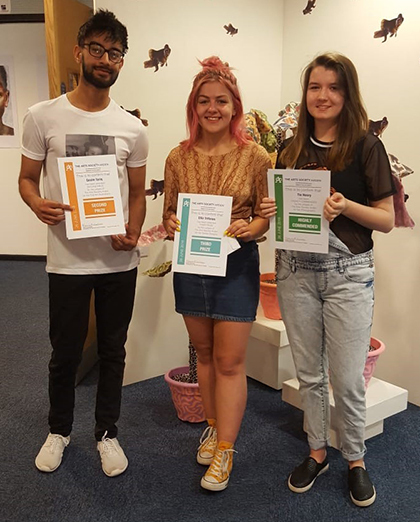 Four Visual Arts students at The Sixth Form College, Solihull have had their talent and hard work rewarded prizes from The Arts Society, Arden. Kathleen Lodge (aged 18, from Birmingham) won first prize for her Fine Art wall hangings. Qasim Taraq (also aged 18, from Birmingham) got second prize for his graphic representation of faces. Ellie Trifonos (aged 18, from Birmingham) won first prize for her textiles work, which included palm trees made of fabric. Meanwhile Tia Henry (aged 18, from Solihull) was highly commended for her photography; she took photographs of nature at night, with bluebells highlighted by flash photography. All the successful students have received cash prizes from Arden DFAS and were presented with their prizes at a ceremony on Tuesday this week. Representatives from the Arden Decorative & Fine Arts Society were on hand to give out the prizes.